As Long as Injustice Continues Against Cuba, So will Solidarity! 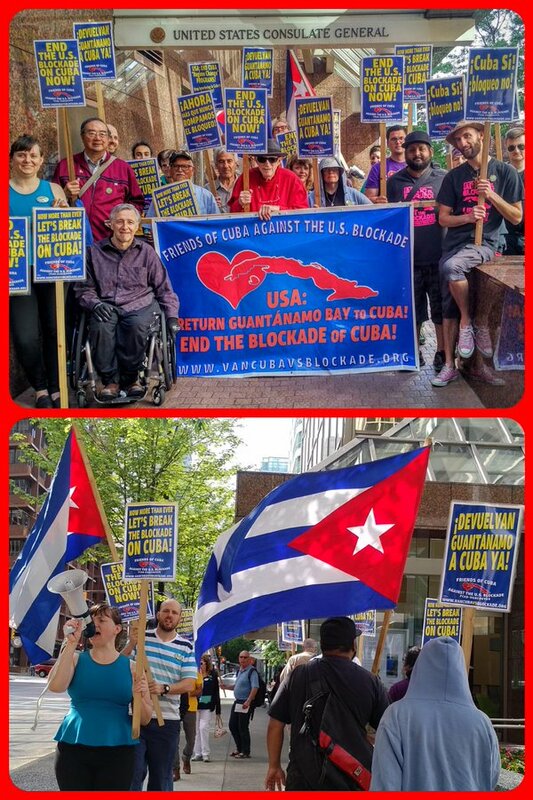 On May 17th 2016, dozens of Cuba supporters gathered in front of the U.S. Consulate in downtown Vancouver to demand an end to the cruel and illegal U.S. blockade on Cuba in an action organized by Friends of Cuba Against the U.S. Blockade – Vancouver (FCAB-Van). This was the 9th such action that have been taking place monthly since the U.S. and Cuba re-established diplomtic relations. Participants chanted “Hey Obama, lift the blockade!” as they circled in front of the Consulate in energetic rounds of picketing. A number of speakers also addressed the participants. 3 of the speakers had just returned from Cuba where they participated in the annual Che Guevara Volunteer Work Brigade. FCAB-Vancouver co-coordinator Azza Rojbi and organizer Janine Solanki, gave reports about the blockade as they learned about its effects while in Cuba. FCAB organizer Max Tennant read a poem about Cuba and the blockade which he wrote while visiting the island. The protest was brought to a close by coordinator of Vancouver Communities in Solidarity with Cuba (VCSC), Tamara Hansen. Tamara spoke clarifying that despite opening up of relations between the U.S. and Cuba, the most criminal aspects of U.S. policy have not been normalized. “As long as the blockade continues and Guantanamo is occupied by the U.S. military, there will be no normalization between the two countries,” Tamara explained. FCAB-Vancouver invited participants again to continue joining in on the 17th of each month in front of the U.S. Consulate until they day the blockade is lifted, Guantanamo Bay is returned and the U.S. stops all interventions against Cuba and its self-determination. Lift the Blockade on Cuba Now! Immediately Stop Interfering in Cuba’s Sovereignty and Self-Determination!